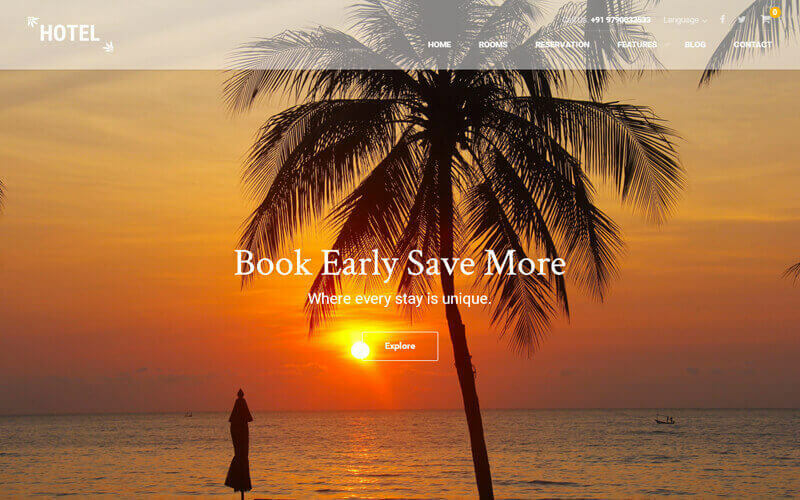 PHP Scripts Mall has developed the world’s favorite revenue generating Online Hotels Booking System with advanced user-friendly booking customization and reservation system. As the internet usage is rolling and emerging across nook and corner of the world the people are started to get their requirements from their place with a single click, as the analysis of our experts the rise of the online booking system revenue is much more than the offline reservation system, so it is great deals for the offline hotel or resort booking entrepreneurs to have their own business booking site. This Reservation and Booking Script is developed and customized based on the user business understanding where the site can be customized globally or localized based on the user requirement. This PHP Reservation Script is designed with our professional designers to make unique user attractive customizing world-class templates and functionality. The users or customers can register their account with their valid mail id and password after the user account has been confirmed, the users can log in to the system. In the home page of the system, they can find the best eye-catching menus like rooms, restaurant and massage center category, and the user can click on the required category when they required. In this PHP Booking Script made easy for the users to check the availability of the rooms or restaurant. The user can also see the hotels master rooms with clear images, landscape descriptions, pricing plans and the reviews etc. In the popup right corner of the page, they can see the recent posts with the date. The user can make the book room or restaurant by just clicking the product to the cart, where the users can make the online payments with our secure online payment gateway integrations. It is easy for the users to manage and view the booking details on our Resort Booking Script, after getting the experience on hotel service the user can submit the feedback and reviews about the hotel room or resort. The user can also link their social networking account links with the site, to feel free and share the user experience about the room. The customers can also get the regular updates by signing up the account with the newsletters. The PHP Booking Script has the best admin portal with authentication login id and the admin has the supreme control to access, control and manage the site with advanced managing tools and functions. This script will make the good revenue generating model script by using the Google ads, banner ads, and other advertisements etc. Through the script is making convenient for both the users and admin to make them efficient in handling the site with SEO-Friendly and mobile friendly customization. PHP Scripts Mall is pride in delivering the products to the clients with user benefits across the globe more than 4000+ clients and 450+ live products with user-friendly customization. In addition with the script will provide 1-year technical support, 6-months software free update, brand free site and bug-free code. Great team work! Good co-ordination. Hi, first of all congratulations for the PHP script Mall team for contributing reservation and booking script. I have downloaded and installed it and it’s all very well explained, complete and easy to install and use. All the very best for your sale. Hi, I have no words!! Good work. All your themes are beautiful but mostly they meet the real expectations of a hotel!! !